Ever since I discovered I have a Rational Heart, I've been exploring the notion of soul mates. Are human beings meant to mate for life? Is monogamy natural? In the United States, the divorce rate has been on a steady climb for the last forty years. The majority of children born in France are born to parents out of wedlock. Many young French couples are opting to cohabitate rather than wed. France! What does it mean when a nation known for its romantic pairings (Napoleon and Josephine, Marie Antoinette and Axel von Fersen, Nicolas Sarkozy and Carla Bruni, to name but a few), is making "to death do us part" obsolete? Hollywood offers little hope. Tinsel town is littered with the wreckage of disasterous unions. Brad and Jennifer. Tom and Katie. Demi and Ashton. Jennifer Lopez and (insert random male name). It makes me wonder. If golden couples who have youth, beauty, money, and fame can't make it work...what chance does the anonymous schlump have? I think of my grandfather. 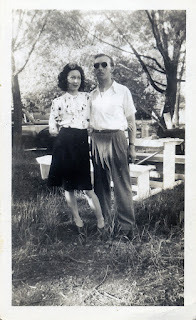 After storming the beach at Normandy, and fighting his way from Angers to Metz, my grandfather met and fell deeply in love with a beautiful young French woman. He asked her to marry him and she agreed. Years later, he would learn she did not love him and they would divorce. I don't pretend to know the complexities of their fractured union, but I do know my beloved grandfather spent the rest of his life allowing his loneliness and bitterness to eat away at his insides. Was that beautiful woman he fell in love with on the streets of Paris his soul mate? Or merely the mate he allowed to take possession of his soul? Was it my grandfather's belief that he'd lost his one true soul mate that propelled him into depression? What would his life have been if he'd abandoned the notion that his wife was his only mate? What if we are supposed to have multiple soul mates? After all, we are, by nature, pack animals. We have families, friends, coworkers. Who said we can only have one soul mate? Perhaps we are meant to mate - not mindlessly rut (though that's not bad every once in a while) - with more than one person throughout our lives. Let me be clear, I'm not suggesting we exchange our slinky LBDs for sister wife smocks. I am not making a plea for plural marriages. I am merely suggesting that it is possible to love more than one person throughout your life - deeply love. And if we can deeply love more than one person, is it not possible we could deeply love more than one mate at a time? It's a radical notion for a person with puritanical roots. Perhaps American society is not yet ready for the notion of multiple soul mates. Look at poor little guitar-plucking Taylor Swift. She's feeling the backlash of living a less than monogamous life. Sure, she's dating a lot, but isn't that healthier than shacking up with the first boy who makes her heart skip a beat? So she writes about her failed attempts to find her "happily ever after" - she's a songwriter, an entertainer. She's a thinking, feeling human being grappling around in the messy world of Love, trying to maneuver her way through infatuation and heartache. So what if she has fallen in love with many a beaux, it's all part of the process. I prefer to shift back to my grandfather. Fear, shame and self-doubt kept him from loving another woman. But what if he'd acknowledged that my grandmother had been his soul mate...for a time? What if he'd embraced the notion that his soul was like Swiss Cheese and there were many mates throughout his lifetime to fill the holes? I feel an uncomfortable shift inside my psyche - like two jagged pieces trying to fit together, my longheld beliefs about each person having a soul mate who completes them and my recent consideration about the notion of multiple soulmates conflict. I've always been a monogamous woman. I've always believed in the highly romanticized concept "you complete me" - but now I'm wondering if my long held notions are correct, or just convenient. Being someone's soulmate is a lot of pressure isn't it? What if I change my mind about a particular political candidate, social issue, or religious tradition? What if I lose interest in football games or fiddle fests? Does that mean we stop being soulmates, that we've grown apart and should separate? Or does it mean we have grown apart in some ways but remain together in others? And if you no longer want to spend your Sundays perched on someone's tailgate, siting idly by listening to your mate wax poetic about Marc Trestman's coaching abilities, does that mean he can't find someone who does? Someone to fill your space at the stadium? Just because you've lost interest in some of your mate's interests doesn't mean you've lost interest in your mate, does it? Even as I type this I feel a guilty pit forming in my gut. Upon becoming bored with soirees, would Elizabeth Bennett have suggested to Mr. Darcy that he head to Almacks to find a new dancing partner? I think not. Think how differently we would have felt watching the ending of Titanic if Rose had bid Jack Adieu, shoved his frozen corpse away, and paddled on to the next warm, male body. "See ya Jack, nice knowing you. Next!" There's no doubting that Jack and Rose were soul mates. Their brief connection made a powerful, lasting imprint on Rose's soul, which is why we see her 80 years later, dreaming about it. But was Jack her soul mate or merely one of her soul mates? We know Rose went on to marry another, whom she confessed she loved. She allowed room in her soul for more than one mate. As a journalist, I know I am supposed to tie all of my thoughts together in one clear, convincing argument, but I am unable to give you that, dear reader. My thoughts are not clear, my argument not wholly convincing. It's taking shape, like an amorphous phantom shimmering in the distance. And so, I leave you with this question: Do you believe we have one soul mate or multiple mates who touch our soul? **Author's note: The photograph featured in this article/blog post is of my grandparents. It was snapped shortly after World War II. It is not to be copied, linked to, or utilized in any way. Thank you for writing this blog post. It made me think about my own beliefs about soulmates. This is a thought provoking post. As I am in my mid-thirties and still searching for my soul mate, several of the things you wrote resonated with me. Answering yes or no to the monogamy question greatly depends on the persons involved, I think...some people will go through life very naturally staying with one person, and others will go through many relationships in search of that "perfect love" and soul mate...I do believe humans are quite able to love more than one person, but society has pretty much set the rules as far as monogamy is concerned and each culture might feel different about it...this is such a complex topic, and so subjective, I'm not sure there is a "right" answer...very thought provoking piece, thank you for writing it! Thank you for reading and for sharing your views. It is a complex topic. As I said, I am a monogamous woman and would not consider being with more than one man at a time. Still, I enjoy pondering these deeper issues and presenting them for discussion. Leah, This is an excellent piece and gives me somethings to think about in regards to the topic. To be connected to multiple people is an idea the resides in my thoughts, but something I struggle with in a puritan country. This pushes myself to rethink the notion of soulmates.